1. Why there is a baby-gate in front of the bathroom door. 2. Why a jagged piece of screen is laying in the driveway. 3. Why there are size 7 footprints on the roof. I walk to the bathroom door and jiggle the handle. “Hi Mom! !” A high pitched voice replies. There is a whirring noise, indicating that the toilet paper roll is being quickly unraveled. I drop to the floor and peek through the crack under the door. The Emperor is standing…yes, standing…in the toilet. “To infinity and beyond!” He yells, charging both fists into the air. “No no no no!” I push my finger under the door, which–while laying on the ground–does not feel like an especially authoritative position. “Do not try to fly out of the toilet.” I say, immediately sure that I am the only person in the world who has ever had to utter this sentence. I call Chuck, who is upstairs in the attic. We then both stand at the door and call Justus. He yells hi to us through a series of splashes. “Do you want to go to the park?” I ask. “And…get a sucker?” I add. “Cheese?” A tiny voice echoes. We see chubby fingers poke under the door. “Yes! Cheese! Just open the door!” We cry out optimistically. He wiggles the handle–which no, in case you’re wondering, is not the kind of handle with a little knife slit that you can pop open from the outside. “Move the bar.” Chuck tells Justus. “Push the button.” I say. We realize, of course, as we stand there, that we might as well be speaking some ancient dialect of Swahili. We make a mental note to teach any future children the meaning of the word “lock” before they acquire the skill of using one. Then, for one hopeful second, Justus sounds like he might be fidgeting with the lock. “NO!! !” he yells. Footsteps run through the growing lake on the floor, back to the toilet. More whirring of toilet paper. A bad realization has dawned. Justus has figured out that we cannot access him. And in his mind, this is his long awaited chance to play in the small ivory ceramic waterpark that servant A (Dad) and B (Mom) tyranically prohibit him from using on all other days. Chuck unscrews the doorknob, hoping we can stick something in to unlatch the locking lever. This amounts to several tiny screws on the floor and a hole the size of the head of a pencil which only provides a clearer picture of the jubilant Emperor as he waves at us in all his blue-footed glory. I then do the only thing left to do, which is to go outside and haul myself up onto the roof using the grill and the porch railing for footholds. Did I mention it’s raining? From the ground, Chuck tosses me a screwdriver and, with my hands extended over my head, I am soon unscrewing tiny phillips head screws from around the window frame. After I get about eight of them out, I am convinced I will be able to lift out the screen and open the window. But this is not what happens. Instead, the screen is stuck. The emperor is pressing his face up against the glass and flaunting “I am in control” smirks at me. From the ground, Chuck mentions maybe we will have to break the screen. This is all the encouragement I need to jam the screw driver through the thin metal gridding and to begin slicing out a rectangle big enough to squeeze through. I then have to call for a sheet, since I imagine the next step of our ridiculous day being a hospital ride to acquire stitches after being cut up by razor sharp screen fragments. At this point, it is a movie. Either a dramatic rescue mission where I am Angelina Jolie in Salt employing my elite stealth training in toddler bathroom rescue. Or a throwback comedy in which the bungling buffoons, shot in black and white, cannot do one single thing right while the neighbors watch with popcorn from their window. All we need is a bucket to get stuck on my foot and a rake to step on. When I finally slide the inside window open, the Emperor is delighted and immediately begins to climb out the window, which is mostly over my head…creating one last layer of risk and impossibility before I wrestle him and the sheet into the room. This is when we put the baby gate outside the bathroom door. This, as it turns out, seems to be just the initial warning that the Emperor will be ruling with an iron fist this summer. 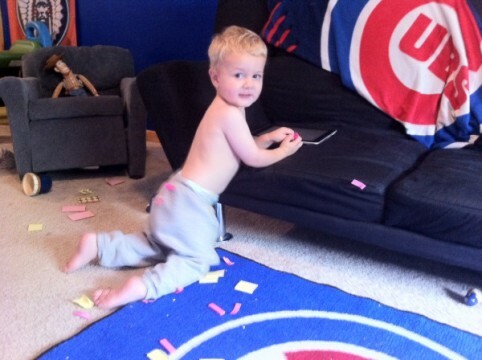 Today, his follow up act was affixing post-it notes on everything in the house–floor, furniture, objects. We have no doubt it was a move to declare all the things which now fall under his rule. Let’s just say if I blog less this summer, you’ll know why. I am crying right now, that is SO funny. Welcome to motherhood! Gotta love it! No worries @Tim. I laughed through the whole scenario as well. It’s hard to miss the humor in someone who takes such joy in unrestrained access to a toilet. Too hilarious! I went through this with our middle daughter a few years ago. And it was the antique doorknobs with the lock you click that is separate from the knob. Scary moments!! I was drawing pictures of the door knob and lock for her to see what to do… to no avail. And as we didn’t have the skeleton keys, I figured there was no way out for the little miss thing. And for some reason, I thought to maybe use a screwdriver in the lock as a last resort… IT WORKED! She was free and I decided to take my kids into the rooms with locks and lock ourselves in and teach them to unlock us. You totally win for hilarity!!! LOL, Sarah! Isn’t it easier to teach at an alternative school than it is to stay one step ahead of a toddler? Little boys are SO busy! There is light at the end of the tunnel though, because three is on the other side of two, and three is one of the most fantastic ages!!! “”It’s hard to miss the humor in someone who takes such joy in unrestrained access to a toilet.” Best quote ever. I liked it so much that I put it on my Facebook profile quotes. Oh, yeah, and I locked myself in my grandparents’ bathroom when I was 2ish, so it happens A LOT. I think my grandpa had to take off the door. On the edge of my seat and kindof mad at my kids while I’m reading. Wondering what they’re doing in the back of the house right now. What a great read!!! LOVE it…and YES, threes are a challenge…then fours and mouthy fives!! Tee hee! That is the proper blog for anyone who needs to seek out out about this topic. You notice so much its almost hard to argue with you (not that I really would want…HaHa). You definitely put a new spin on a topic thats been written about for years. Nice stuff, simply great!